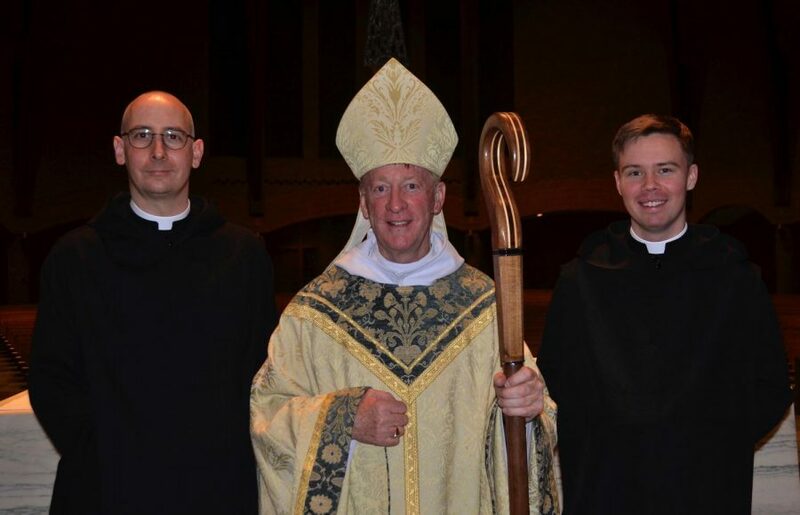 From left to right, Brother Dunstan, Abbot Mark, and Brother Titus at the vow ceremony on January 15. Recently, Saint Anselm Abbey celebrated two monks as they took their next step in their religious journey. Brother Titus Michael Phelan, O.S.B. ‘12 and Brother Dunstan Noah Enzor, O.S.B. gave their first profession of their monastic vows surrounded by family, friends, and their fellow monks. Both monks came to Saint Anselm College at the beginning of the 2017 school year, with Brother Titus arriving in August, and Brother Dunstan a month later in September. Brother Titus is not a stranger to Saint Anselm, as he was a member of the class of 2012. Originally from Swampscott, Massachusetts, Brother Titus majored in politics before deciding to embrace the monastic lifestyle. During his time as a student he would occasionally come for the Holy Week Retreat. Following his graduation from Saint Anselm he received his Masters from the University of Notre Dame. The first profession of monastic vows is an honored ceremony that is a long time in the making. When the two Brothers entered the monastery in 2017, they were postulants. According to Brother Dunstan, postulant derives from the Latin word postulare which means “to ask”. This symbolizes the postulant’s asking of himself, the community and the Lord whether to proceed with this path. This is reminiscent of Conversatio’s tagline of the individual, the community and the divine that each Freshman is familiar with. “The postulancy is a couple of weeks to months, it varies person to person, to get accustomed to the community and community life.” Added Brother Titus. Following the postulancy, if the monks choose to continue, they enter the Novitiate as Novices. The Novitiate is a one-year period of study, prayer, and discernment during which the Novice continues to become accustomed to monastery life. “Right before we became novices, we received a conference from one of the senior monks, Father John, in which he said that the Novitiate is a dialogue between the novice and god, the abbot, and the community.” Brother Dunstan explained. He further described that year as one of questions and answers. In addition, during the Novitiate the two Brothers changed from wearing their own clothes to wearing the religious habit for the first time. Brother Dunstan said that when it came time to choose his name that he had a strict set of criteria. He wanted the name of someone who had been a saint, someone about whom a good amount was known, and someone who had been a monk. “I came to the idea of Saint Dunstan of Canterbury, who was a tenth century Anglo-Saxon Abbot, and then Archbishop. That fit in very well in this community because there are two other monks here who are named after former Archbishops of Canterbury: Father Augustine and Father Anselm.” In fact, about fifty years after Saint Dunstan was Archbishop of Canterbury, Saint Anselm took the position. Once the year of the Novitiate was over, the two were prepared to make their first profession of vows in the Abbey Church. Now that the two Brothers have taken their first vows, they plan to continue their studies of theology at Saint John’s Seminary in Boston. They are also shadowing different professors in the Conversatio program. They are currently in the Juniorate phase, which is a three-year long period after which they may take their lifelong Solemn Vows. That means the next phase of their journey won’t begin until 2022.